The Smith & Wesson Model 3 was a single-action, cartridge-firing, top-break revolver produced by Smith & Wesson from circa 1870 to 1915, and was recently again offered as a reproduction by Smith & Wesson and Uberti. It was produced in several variations and sub-variations, including both the "Russian Model", so named because it was supplied to the military of the Russian Empire (41,000 No. 3's were ordered in .44 caliber by the Imperial Russian Army in 1871), and the "Schofield" model, named after Major George W. Schofield, who made his own modifications to the Model 3 to meet his perceptions of the Cavalry's needs. Smith & Wesson incorporated these modifications into an 1875 design they named after the Major, planning to obtain significant military contracts for the new revolver. The S&W Model 3 was originally chambered for the .44 S&W American and .44 Russian cartridges, and typically did not have the cartridge information stamped on the gun (as is standard practice for most commercial firearms). Model 3 revolvers were later produced in an assortment of calibers, including .44 Henry Rimfire, .44-40, .32-44, .38-44, and .45 Schofield. The design would influence the smaller S&W .38 Single Action that is retroactively referred to as the Model 2. Smith & Wesson No. 3, open for loading. Note: the automatic ejector is up. Smith & Wesson produced large numbers of the Model 3, in three distinct models, for the Russian Empire by special order. The first was the 1st Model Russian (the original order design), with the Russian Ordnance Inspector mandating a number of improvements to the design, resulting in the 2nd Model Russian, with a final revision to the Russian design being known as the 3rd Model Russian. Smith & Wesson nearly went bankrupt as a result of their Russian Contract production, as the Imperial government assigned a number of engineers and gunsmiths to reverse-engineer the Smith & Wesson design, and then began to produce copies of the revolver—both in their own arsenal at Tula and by contracting other manufacturers in Germany and elsewhere in Europe to manufacture copies of the revolver (a common practice at the time—Webley & Scott's British Bulldog revolver was widely copied, too, by European and American gunsmiths). The Russian and European copies of the S&W Model 3 revolver were generally of very high quality, but considerably cheaper than the S&W produced revolvers. This led to the Imperial government cancelling the order for significant quantities of Smith & Wesson–made revolvers (which Smith & Wesson had already produced), and delaying (or refusing) payment for the handguns that had already been delivered. The U.S. Army adopted the .44 S&W American caliber Smith & Wesson Model 3 revolver in 1870, making the Model 3 revolver the first standard-issue cartridge-firing revolver in US service. Most military pistols until that point were black powder cap and ball revolvers, which were (by comparison) slow, complicated, and susceptible to the effects of wet weather. In 1875, the US Ordnance Board granted Smith & Wesson a contract to outfit the military with Model 3 revolvers incorporating the design improvements of Major George W. Schofield (known as the "Schofield revolver"), providing that they could make the revolvers fire the .45 Colt (AKA ".45 Long Colt") ammunition already in use by the US military. Smith & Wesson instead developed their own, slightly shorter .45 caliber round, the .45 Schofield, otherwise known as the .45 S&W. When it became obvious in the field that the two cartridges would not work interchangeably in the Schofield (although they both worked in the Colt), the U.S. Government adopted the shorter .45 Schofield cartridge as the standard cartridge. Despite the change, old stocks of the longer .45 Colt rounds in the supply line caused the Army to drop most of the Schofields and continue with the Colt. Major Schofield had patented his locking system and earned a payment on each gun that Smith & Wesson sold, and at the time his older brother, John M. Schofield, was the head of the Army Ordnance Board and the political situation may have been the main issue for the early end of army sales. Many of the S&W Model 3 Schofield revolvers saw service in the Indian Wars, and there are reports of them in use as late as the Spanish–American War and Philippine–American War. Like the other Smith & Wesson Model 3s, they were also reportedly popular with lawmen and outlaws in the American West, and were reportedly used by Jesse James, Bob Ford (who used one to kill James), John Wesley Hardin, Pat Garrett, Theodore Roosevelt, Virgil Earp, Billy the Kid, and many others. The Smith & Wesson No. 3 revolver was famously used by Wyatt Earp during the OK Corral Gunfight with the Clanton Gang. While the standard barrel length was 7", many Schofields were purchased as surplus by distributors, and had the barrels shortened to 5", and were refinished in nickel. After the Spanish–American War of 1898, the US Army sold off all their surplus Schofield revolvers. The surplus Schofield revolvers were reconditioned by wholesalers and gunsmiths (at professional factory-quality level) with a considerable number offered for sale on the commercial market with a 5-inch barrel as well as the standard size barrel of 7 inches. Of the most notable purchasers of these reconditioned model 3 Schofield revolvers was Wells Fargo and Company, who purchased the revolvers for use by Wells Fargo Road Agents and had the barrels shortened to a more concealable 5 inches length. These revolvers were then inspected by the Wells Fargo armorer and uniquely stamped "W.F. & Co" or "Wells Fargo & Co", along with the original Smith & Wesson serial number re-stamped alongside the Wells Fargo stamping on the flat part of the barrel just forward of the barrel pivot as well as re-stamping any part of each revolver which had not originally been stamped or stamped in a location that would be difficult to view the serial number, when needed. The Wells Fargo Schofield revolvers became so popular with collectors from the 1970s onwards that the unique Wells Fargo markings were being "counterfeited" or "faked" by unscrupulous sellers to enhance the value of other similar versions that had not been genuinely owned by Wells Fargo & Co. There are more "fake" Wells Fargo marked Schofield revolvers than genuine ones in existence and, accordingly, a collector interested in purchasing a "Wells Fargo" Schofield revolver would be well advised to have a pre-purchase inspection and verification performed by an expert who specializes in this model. Lieutenant Colonel Schofield shot himself on December 17, 1882, with a S&W Schofield revolver after suffering a bout of mental illness, stress and isolation. An engraved, gold-plated New Model Number 3 with pearl grips was presented to sharpshooter Annie Oakley in the 1890s by her husband Frank Butler. The revolver was one of three embellished guns that were cased for Oakley as a presentation group. The Schofield was produced in various versions. The First Model Schofield has a latch configuration that is rather pointed at the top and has a circle around the screw head at the bottom. The Second Model latch has a large raised circle at the top of the latch. One of General Schofield's revisions and improvements to the predecessor Model 3 Revolvers included mounting the spring-loaded barrel catch on the frame as opposed to the standard Smith & Wesson Model 3 which has the latch mounted on the barrel. In the previous engineering, the posts of the frame would wear out after heavy usage. Schofield's improvement called for heat treated, replaceable components at this sensitive "wear" area of the catch and latch. The serial number range also will give an indication of whether it is First or Second Model, with the serial numbers changing from the First Model to the Second Model at a little over 3,000. In 1877, S&W discontinued production of its other Model 3s such as the American, Russian, and Schofield—in favor a new improved design called the New Model Number Three. This new model has a longer cylinder allowing it to fire longer cartridges. Standard chambering was .44 Russian, although other calibers were offered on special order or in related models such as the .44-40 Frontier Model, the .32-44 & .38-44 Target Models, and the very rare .38-40 Winchester Model. In 1880 the South Australia Police, who were then interested in re-arming with up-to-date weapons, noted a display of New Model Number Three revolvers at the Australian Exposition in Melbourne. At the direction of Police Commissioner Peterswald an order was placed through S&W's New York agent for 250 nickel revolvers in .44 Russian with a seven-inch barrel length. The order, which included extension shoulder stocks, ammunition, and reloading kits, arrived at Adelaide in March 1882. The revolvers and stocks were thereupon marked with a government broad arrow punch mark, and were called revolver-carbines. They were issued to mounted police, known as troopers, who at that period also policed the Northern Territory. Both the South Australia and Western Australia police made further small purchases during 1886-88, none of which was marked with the broad arrow. For some thirty years the revolver-carbine was the front line weapon of the mounted police of S.A., W.A., and N.T. Nearly all serial numbers are known, and are listed in the book Service Arms of the South Australian Police. 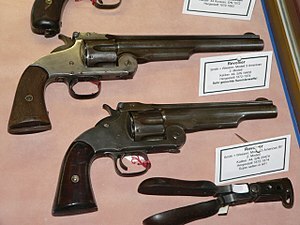 The S.A. revolvers were sold as surplus in 1953 to the Western Arms Corporation of Los Angeles. The popular Model 3 was copied in many countries. Most common were the versions made in Spain, Mexico and Belgium; but companies such as Ludwig Loewe & Company of Germany and the Tula Arsenal in Russia played a hand in the counterfeit game, too. Copies have been found in Turkey and Pakistan as well, made by local manufacturers. An Orbea Hermanos revolver at the Seville Military History Museum. In 1884 the Spanish government made a decree stating that any invention not copyrighted by their copyright office was not under their protection. One victim of this was Smith & Wesson, whose lucrative contract to produce Model 3 revolvers for the Spanish Army was quickly cancelled. Its work given to local gunsmiths in Eibar by different firms without any standardization of parts. The Orbea Hermanos Modelo 1884 Sistema ONÁ (Basque oná > "good") or "S&W Model 7" revolver was made from 1884 until the 1920s. It is notable for its grip medallion, which is an "OH" interlaced like the Smith & Wesson "S&W". An interesting footnote is that Smith & Wesson immediately copyrighted all of their other designs in Spain from then on. That is why their firearms have MARCA REGISTRADA and the date of the Spanish patent on their barrels. There were a number of unauthorized Belgian copies made in .44 Russian and .44-40 Winchester as Single and Double Action revolvers. These copies, mostly manufactured in Liege, were marked as if to deceive a buyer into thinking that they were a revolver produced by Smith & Wesson. Many of the finer details such as the location of the Smith & Wesson factory were incorrectly stamped on the revolvers ("New York" and "VK" being the two most common). Smith & Wesson brought lawsuits against two gunmakers in Liege, which they originally lost, but won on appeal. The prime contractor for the Italian military was Orbea, which chambered their revolvers for the Italian 10.4mm cartridge. These Spanish-made revolvers were used during World War I, and according to online sources were the preferred handgun of elite Arditi troops. Many Spanish firearms were captured by the Liberation Army during the Revolution, among them Model 1884 revolvers. Some were brought by defectors from the Spanish military. These handguns also saw service, later, in the Philippine-American War. Revolvers for the Romanian military were chambered for the .44 Russian cartridge, and were made by Trocaola, Aranzabal y Cía. These Spanish-made revolvers were used during World War I.
Spain used these revolvers, which were chambered for the .44 Russian cartridge, during the Philippine Revolution, the Spanish–American War, the Rif War, and the Spanish Civil War. The M1884 was later briefly made chambered in .455 Webley for British government contracts in 1915 and 1916. It was designated by the British Army as the "Pistol, Old Pattern", due to its old design. They were dubbed "Spanish Webleys" by troops even though they were copies of the S&W Model 3. Orbea Hermanos y Cia., Garate, Anitua y Cia., and Trocaola, Aranzabal y Cia. were contracted to make 30,000 revolvers among them. Orbea Hermanos was the major contractor and the other two were sub-contractors. Rexach & Urgoite was later contracted in 1916 to make 500 pistols but all failed proofing and the lot was refused. Finish and quality control was varied throughout the run of production. The fact that they were making service pistols and revolvers for France and Italy at the same time was definitely a factor. As there was no standardization of design or parts between manufacturers, each manufacturer's model was considered a different gun altogether. The Garate, Anitua y Cia. model was designated the Pistol, Old Pattern, No.1 Mk.I, the Trocaola, Aranzabal y Cia. model was designated the Pistol, Old Pattern, No.2 Mk.I, and the Orbea Hermanos model was designated the Pistol, Old Pattern, No.3 Mk.I. The weapons were given to the Royal Ulster Constabulary after the war. The RUC later sold them off to the New South Wales Police Force, who made snub-nosed revolvers out of them and issued them as backup pistols. A cut-down snub-nosed .455 "Old Pattern" Revolver was carried by one of Michael Collins' bodyguards. Modern reproductions of the Smith & Wesson model 3 Revolver are made by a number of companies, including (most notably) Smith & Wesson themselves, as well as the Italian arms-makers Uberti and Armi San Marco. Smith & Wesson manufactured a modern reproduction of the original Model 3 Revolvers from 2000 to 2003. Despite being touted as a "true" reproduction, there are significant differences between the modern version and the original. Side-by-side comparison of an original with the pre-production gun showed that the new version is slightly more stout than the original around the barrel and top strap, though not as much as on the Navy Arms guns. Changes in the internal lock mechanism were also made. The "reproduction" S&W Model 3 firing pin is frame-mounted instead of being an integral part of the hammer, a modern safety feature – with a transfer bar as a practical safety catch in a revolver – preventing accidental discharge if dropped. There is no transfer bar on the firing pin but a blocking bar on the hammer, should it slip off the thumb when cocking the pistol. A heavier cylinder was fitted into the stronger frame. Unlike the Uberti reproductions that have a longer-than-original cylinder and frame the S&W was made to only accommodate the shorter original Schofield rounds. The Uberti version, imported by Navy Arms and Cimarron Firearms, has external dimensions generally similar to the original 2nd Model Schofield, but the barrel and topstrap are considerably thicker, for additional strength. These replica Model 3 revolvers have lengthened cylinders to accommodate .45 Colt and .44-40 cartridges. Although there were some problems with the locking latch angles in early versions, these were generally corrected or the revolvers were replaced. European reproduction Model 3 revolvers have changes made to their lockwork to meet import regulations. A Uberti produced reproduction was also marketed as the Beretta Laramie. Clint Eastwood's 1992 film Unforgiven features a character called the "Schofield Kid" (Jaimz Woolvett), named after the Model 3, his weapon of choice. In the 2007 film 3:10 to Yuma, Charlie Prince (Ben Foster) carries two Smith & Wesson Schofield Model 3 revolvers. ^ McNab, Chris (2009). Firearms. Queen Street House, 4th Queen Street, Bath BA1 1HE, UK: Parragon. p. 62. ISBN 978-1-4075-1607-3. ^ a b c d Boorman, Dean K. (2002). The History of Smith & Wesson Firearms. Guilford, Conn.: Globe Pequot Press. pp. 31–33, 37. ISBN 978-1-58574-721-4. ^ a b c d e f g h i j k l m Supica, Jim; Nahas, Richard (3 January 2007). Standard Catalog of Smith & Wesson. Iola, Wisconsin: F+W Media, Inc. pp. 88–103. ISBN 0-89689-293-X. ^ Kinard, Jeff (2004). Pistols: An Illustrated History of Their Impact. ABC-CLIO. pp. 129–135. ISBN 978-1-85109-470-7. ^ a b c Agnew, Jeremy (1 November 2012). The Old West in Fact and Film: History Versus Hollywood. McFarland. p. 150. ISBN 978-0-7864-9311-1. ^ "REVOLVER - SMITH & WESSON REVOLVER MODEL 3 SCHOFIELD FIRST MODEL SINGLE ACTION .45 SN# 1532". Springfield Armory Museum. ^ Autry National Center (12 January 2012). "Annie Oakley's Pistols". ^ Lee, Jerry (29 January 2016). 2016 Standard Catalog of Firearms: The Collector's Price and Reference Guide. "F+W Media, Inc.". p. 1034. ISBN 978-1-4402-4441-4. ^ Taylerson-Chamberlain, W. H. J. and A. W. F. Revolvers of the British Services, 1854-1944, pp. 57-59. ^ Taffin, John (2006). The Gun Digest Book of the .44. Iola, Wisconsin: Gun Digest Books. p. 37. ISBN 0-89689-416-9. ^ a b c Supica, Jim; Nahas, Richard (3 June 2016). Standard Catalog of Smith & Wesson. Iola, Wisconsin: "F+W Media, Inc.". p. 438. ISBN 978-1-4402-4563-3. ^ "Uberti Top Break: No. 3 New Model Russian, No. 3 2nd Model". A. Uberti. Archived from the original on February 1, 2010. Retrieved April 23, 2010. This page was last edited on 6 April 2019, at 10:58 (UTC).